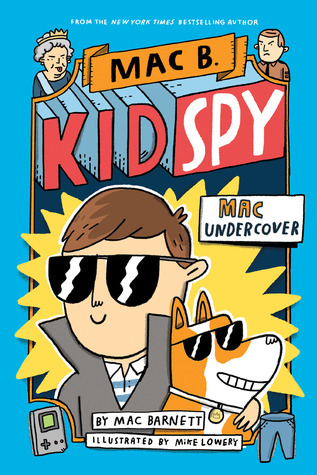 First things first: Mac B., Kid Spy: Mac Undercover is a hoot. I read a lot of children's books that claim to be funny but this one really had me smiling all the way through. I thought that was worth mentioning, in case you skip everything else. Awkward title, though. Mac B., Kid Spy: Mac Undercover is fiction, of course, but the author humorously calls it a memoir of his time as a spy. At the opening of the book, Mac reflects on a time when Her Royal Highness, the Queen of England called Mac. She chose him because he had A's in every class (although his handwriting needed work). She needed a spy to find her missing crown jewels. Actually, just one piece of the crown jewels: the Coronation Spoon. Sure, Mac was American and a kid, but he was definitely the right guy for the job. In 1989, after receiving the phone call, Mac flies to England, where he's given instructions and learns about the spoon. He is given a secret identity kit and the queen loans him one of her corgis to help out. Mac follows the trail from London to France to Moscow and then goes home without his pants. * It's an interesting story. Highly recommended - I think what I loved most about Mac B., Kid Spy: Mac Undercover was the fact that it was educational. Any time the author shares some interesting fact he says, "You can look that up." I looked up a few things. Some I already knew because I'm not in middle school. I knew nothing at all about the Coronation Spoon. That was quite interesting. I lived through 1989, so I know a little bit about the reason Mac went home without his pants. Anyone who lived through the 80s knows all about that (it's a spoiler, sorry). The worst thing about the book is the title, but I loved the book so much that I found myself wishing the publisher had sent me the next book in the series. A great book for the adventurous, humor-loving middle grade reader in your world. Also great for class or library.